The Cyclades harbour perhaps the majority of the must-see islands of Greece with beautiful places like Sifnos, Santorini, Naxos, Folegandros, Paros, Kythnos, Andros and Tinos. And the perfect way to explore these islands is via bareboat yacht charters. Cruise ships and ferries will only serve the major - less interesting - ports of the larger islands. Likewise package holidays (often cabin charters) on for instance motorsailers will only visit these appealing spots when you rent the whole yacht - full charter or private charter. Catamarans are not popular in Greece or Turkey, hence the choice for bareboat yacht charters is often limited to the regular monohulls: Jeanneau Sun Odyssey, Bavaria, Beneteau Oceanis, GibSea, Dufour or Ocean Star yachts. The locally built Atlantics and Apollo 12 yachts should be avoided. Bareboat yacht charters in the Cyclades require more navigation skills then anywhere else in Greece. Not only are the distances between ports and anchorages longer, also the weather is more fierce and not only the Meltemi can bring stress on board, the longer fetch will mean higher and rougher waves from the predominantly northerlies. 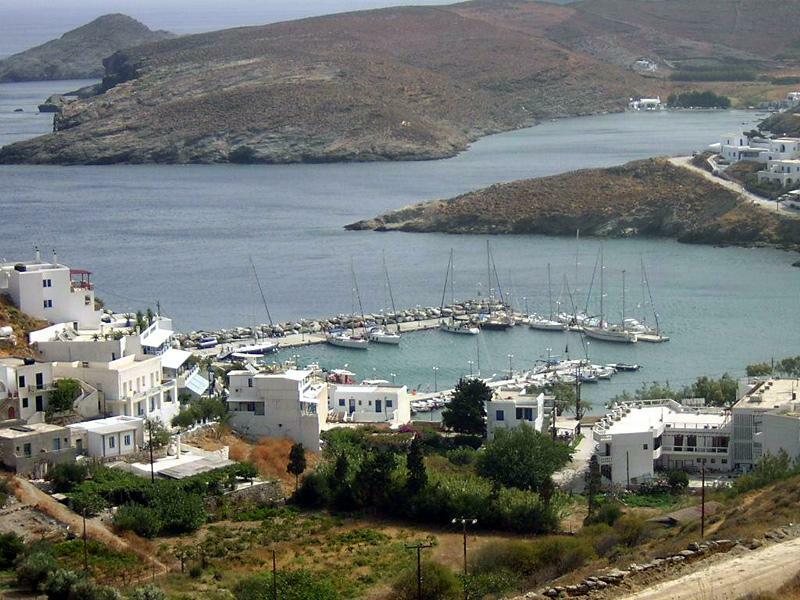 The best ports for bareboat yacht charters in the Cyclades are Syros and Paros. From here it is easier to reach the southern islands of the Aegean. If you don't fancy taking a ferry or hydrofoil it is worth taking a look at Lavrion on the southeast tip of Attica. Similarly you can reach the Cyclades from Samos (Pythagorion marina) or Kos. And for bareboat yacht charters - instead of crewed charters - it is often possible to sail a one-way trip from for example Athens to Paros or Paros to Rhodes (combining the Dodecanese). Another combination is the Argolic with the Cyclades. The best points to cross for bareboat yacht charters or other sailing vacations are Hydra-Kythnos or Monemvassia-Sifnos/Milos.
.: Back to Kythnos island:.